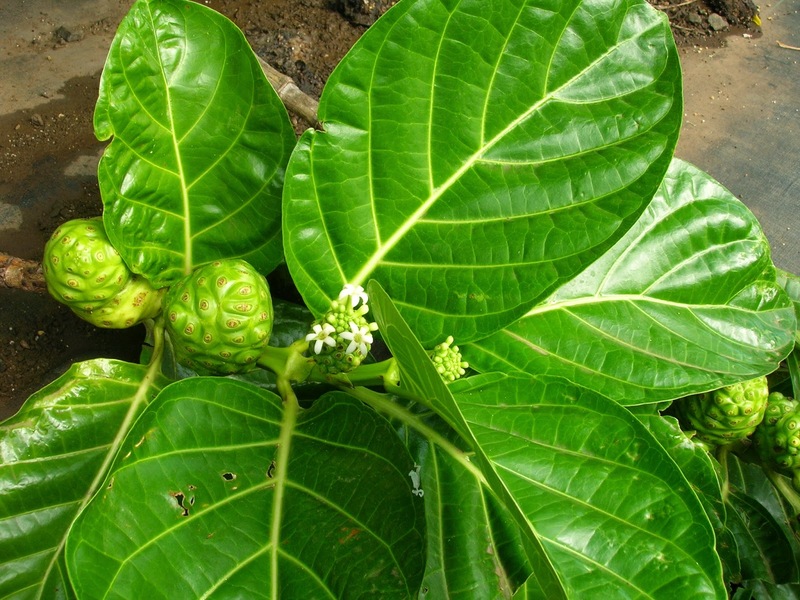 Noni or mengkudu in bahasa are so familiar found in every places, this plants has Latin name: Morinda citrifolia L.
Habitat: Grows wild on the beach and planted all over the archipelago. This plant can be grown on land with an altitude of 1-1500 m above sea level. Local name: Noni; Kudu; kemudu; Cangkudu; bengkudu; Keumudu; Lengkudu; Bakudu; Kodhuk; Pace; Benthis; Makudu; Mekudu; Bingkudu; Wangkudu; Kungkudu; Manakudu; Bangkulu; Pamarae; Neteu; Labannan; Tibah; Ai-combo. Noni (Morinda citrifolia), including the type of coffee plants. Noni can grow in the lowlands to the ground altitude 1500 meters above sea level. Noni is a native plant of Indonesia. This plant has a trunk is not too big with a tree height of 3-8 m.
Leaves are facing a double decker, leaves 20-40 cm long and 7-15 cm wide. Hump​​-shaped relationship flowers are tiny and white. The fruit is glossy green and elliptical buni tangible fruit with variations dots. Seeds many small and contained in the fruit flesh. In general, the noni plant breeding in the wild in the forests or maintained the edges of the garden house. Simplesia Name: Fructus citrifoliae Morindae. Plant part used: Fruit; roots; leaves. Noni (grated) 1 piece; 100 ml of boiled water, then Brewed water plus one teaspoon of honey, To rinse; the ingredients are not harmful if swallowed. Noni (shredded) 2 pieces; Vinegar diluted slightly, Squeeze and strain, once a day Drink 1 1 potion. Noni (grated) 1 piece; 2 bananas stone fruit; 110 ml water, Brewed, Drink 1 day 100 ml. High blood pressure, noni fruit (grated) 1 piece; 100 ml of boiled water, Brewed, Drink 1 day 100 ml. then mixed with honey until evenly distributed and screened. to boil down to 1 cup, and then filtered. How to use: drink 2 times 1 day, morning and afternoon.